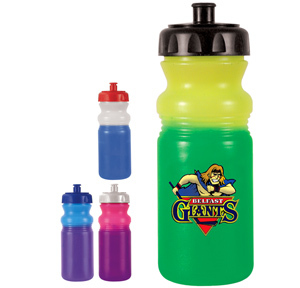 Add a splash of color to your already exciting sporting event and promote your organization with custom printed mood water bottles. With custom printed mood water bottles you will wow the crowd with the color changing bottles and get them to notice your brand. 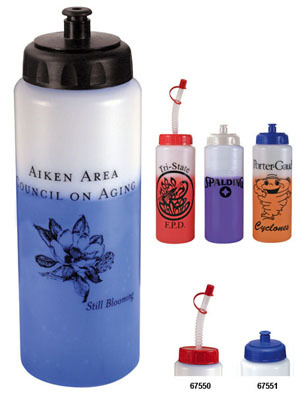 Mood waterbottles are a cost-effective promotional item because they are reusable and extend the life of your marketing dollars because every time it is used people will remember where it came from. Order your mood waterbottle today and imprint it with a logo, name, or custom artwork to spread the about your organization, business, or event. Pricing Includes: a one-color silk-screened imprint on one or two sides. Unless specified, orders will be set-up as a one side imprint. All caps shipped unassembled. Please be sure to specify bottle and cap color when ordering. Item Colors: Frosted to Blue, Frosted to Red, Frosted to Purple, Frosted to Orange. Assorted colors are available. Imprint Colors: Black, White, Red, Lt. Blue, Med. Blue, Dk. Blue, Med. Green, Dk. Green, Brown, Purple, Yellow, Teal, Orange, Maroon, Gold, Athletic Gold, Silver. Black is recommended. Pricing Includes: a one color silk-screened imprint on one or two sides. Unless specified, orders will be set-up as a one side imprint. All caps shipped unassembled. Please be sure to specify bottle and cap color when ordering. Imprint Area: 4" W x 6" H per side. Pricing Includes: Full color printing using four-color process colors (cyan, magenta, yellow and black) on one side. Images and type should be in CMYK. Additional art charges will apply to convert colors. Exact PMS matches are not possible. Neons and metallics are not available. Push 'n Pull caps are shipped unassembled. Please be sure to specify bottle color and cap color when ordering. Item Colors: Yellow to Green, Blue to Purple, Pink to Purple, and Frosted to Blue. Imprint Area: 3" W x 2-3/4" H .
Cap Colors: White, Red, Black, Blue. The staff at Logo.me is committed to fast, flexible, friendly and personalized service through a committed core of efficient, detail-oriented professionals. 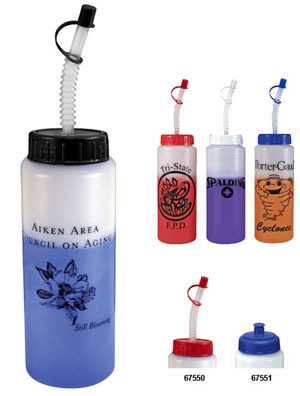 We offer an expansive and versatile line of promotional products to fit any budget. We are here to make your promotions simple and easy!